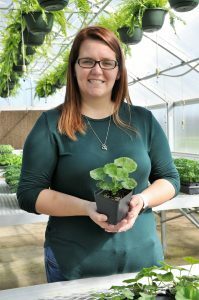 Christina Sanders is connecting classroom to real life as an agricultural teacher at Northside Middle School. Christina Sanders did not grow up on a farm, but as she grew to love agriculture, it inspired her to share her passion with the next generation of agricultural leaders. The 27-year-old Fort Valley State University alumna, who grew up in a subdivision in Eastman, Georgia, said her inspiration first came in ninth grade from her agricultural teacher at Dodge County High School. “My teacher showed me that there is more to agriculture than just farming. I found a lot of success through it. I liked all that I learned, but the fact that we had people who invested in us so much was probably the key element,” she said. On the path to continue her education at Abraham Baldwin Agricultural College (ABAC) in Tifton, Georgia, Sanders’ plans suddenly changed when she experienced death in her family. Her stepfather died following the first semester of her freshman year. As a result, Sanders returned home and enrolled in the former Middle Georgia College (MGC) to finish her core classes. She later transferred to FVSU when she learned of the university’s agricultural education program. Although Sanders had to commute from Eastman to Fort Valley, this did not stop her from pushing forward. “I knew I was going to struggle for a little to get through college. My parents were not in a place to help me financially, so I had to make it on my own. My mom did the same thing, but she had two kids. She went to nursing school when I was 7 years old. I get a lot of my drive from my parents,” Sanders said. In addition to her parents being a motivating factor, Dr. Curtis Borne, FVSU professor and coordinator of the agricultural education program, made an impact on her studies. “Dr. Borne was an asset to making sure that I was successful. He was good about helping me find a job as a student worker at the horse barn. He believed in me and was a good ‘agvocate,’” Sanders laughed. Also working at Wal-Mart in Eastman, she said Borne helped her earn an internship at the Go Fish Education Center in Perry. “The university was really good about working with me. I love the College of Agriculture. The atmosphere is fantastic and we received more hands-on learning from a smaller setting,” Sanders said. In 2013, she earned her bachelor’s degree in agricultural education from FVSU. After graduation, the FVSU alumna taught for two years in North Carolina and Grady County, Georgia, before teaching at Northside Middle School in Warner Robins, Georgia, in 2015. The following year, she earned a master’s degree in agricultural education from the University of Missouri. Sanders said good teaching requires getting on the students’ level. “Many of the kids I teach are growing up in tight communities and do not connect the agriculture and consumer side of things. I am trying to show them where their food and clothes come from and how agriculture touches everything that we do,” she said. Her goal each day when she steps into the classroom is to challenge her students. “I want them to be critical thinkers and to challenge what they are learning, research it and then take it outside the classroom,” Sanders said. Another role Sanders plays is serving as a Future Farmers of America (FFA) advisor, guiding 85 student members. “Our students are very successful with their projects. We have placed in the top 5 of everything we have done. I’m happy with that,” she said. Her FFA students receive hands-on training in the on-campus greenhouse and on the school farm shared with Northside High School. “We are trying to connect classroom to real life. They are learning skills that are applicable for that,” Sanders said. Seventh-grader Payton McKinney knows this firsthand. Payton said she became interested in animals when she took Sanders’ class and realized she wanted to join FFA. “I learned how amazing this experience can be, let alone how frustrating it can be,” said Payton, who desires to own a livestock farm one day. Sanders, who is currently earning a specialist degree in agriscience education from Auburn University, continues to push for success. She encourages her students to do the same. Sanders resides in her hometown with her husband, Chris, and their 2-year-old daughter, Blair.